These banana cake nut butter brownies are quite the revelation. 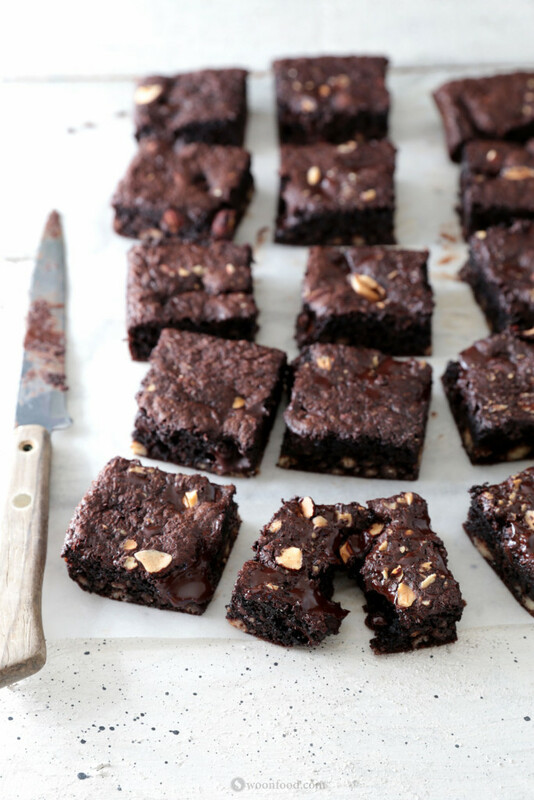 Apart from tasting like a cross between a moist banana cake and an intense chocolate brownie, they have a very low unrefined sugar content and are made without any flour, butter or oil. Instead these ingredients are replaced by nut butter! Despite the total lack of flour these brownies are remarkably light to the point I considered calling them ‘devils food cake’ which is typically a moist, airy, rich chocolate cake. But as they do also have a sticky brownie quality to them, and are probably way too healthy to be called devils food cake, brownies they are. Inspiration for using nut butter instead of flour came from a recent post by Sarah B on the amazing My New Roots blog, although it appears the idea itself has been around the internet for a while. Essentially by using a combination of eggs and a little baking soda, you can do away with any flour and butter/oil and replace it with nut butter which provides the same qualities but with a heap more beneficial nutrients and protein. I’ve been playing around with this recipe idea for a couple of weeks and every time I go to make it I end up with a completely new version: double chocolate brownies, chocolate chip cookies, blueberry and vanilla cookies (which taste like blueberry muffins!). 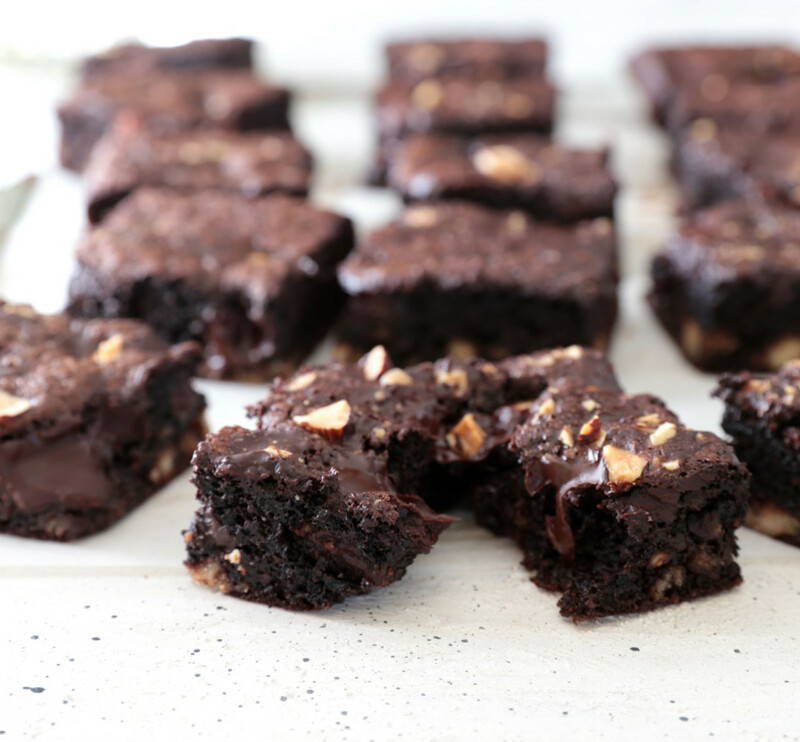 The list will no doubt continue to grow, but the best by far has been these banana cake nut butter brownies. The chocolate chunks in the recipe are optional. 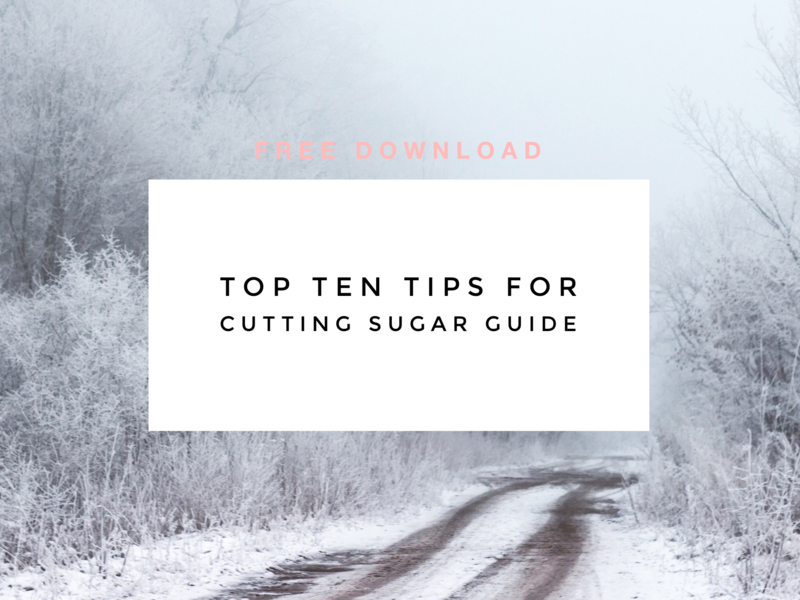 If you want to keep the brownies entirely refined sugar free, leave this part out and you could substitute it for chopped nuts of your choosing. I picked up the wrong chocolate in the supermarket, instead of plain 70% I ended up with roasted almond chocolate which I didn’t discover until I was cutting it up for the recipe. As it turned out, almond chocolate was pretty damn amazing too. So if you can get it, that would be my recommendation! When choosing chocolate, if you want to keep the brownies dairy free make sure you choose a dark chocolate with no milk products in it, and the darker the better as this coincides with a higher antioxidant level and generally lower sugar levels. These Banana Cake Brownies are amazing straight out of the oven when the chocolate is all warm melted, and they will keep for about 5 days in a sealed container. Enjoy! 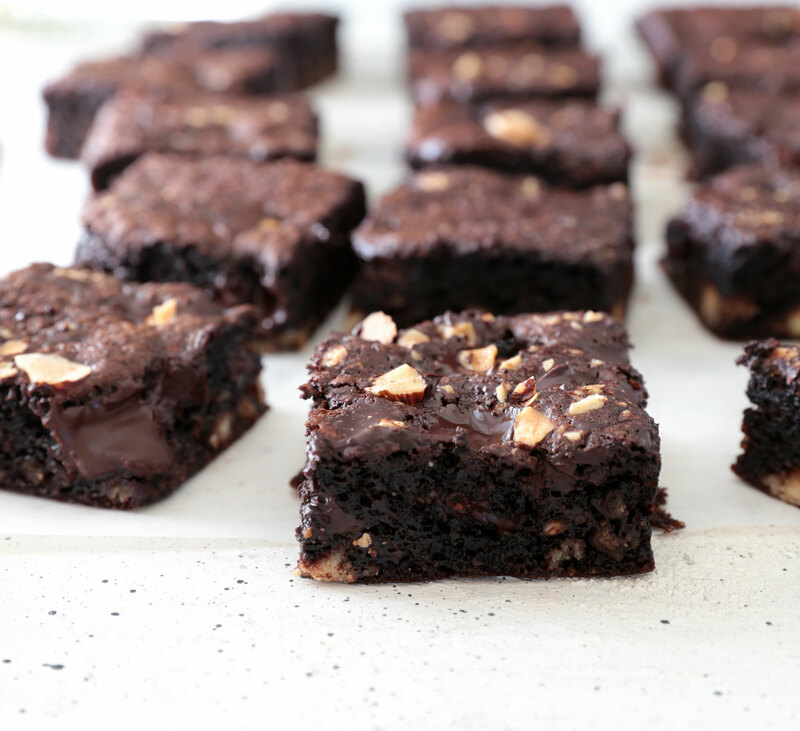 Any comments or questions on these nut butter brownies? Leave a comment in the section below – I love to hear from you! Preheat your oven to 160ºC fan bake. Line a 20cm x 20cm square tin or 16cm x 30cm rectangular tin with baking paper. Combine the mashed banana, eggs, coconut sugar, cocoa and salt. Stir in the nut butter ensuring the mixture is well combined (use an electric beater for this if you prefer). Stir in the baking soda ensuring there are no lumps and everything is well combined. Pour the mixture into the lined tin and spread the mix out evenly. Sprinkle with chocolate or nuts if using, and place the brownie into the centre of your pre-heated oven for approximately 20-30 minutes. The banana cake brownie is ready when a skewer inserted into the middle comes out clean. Note: if using chocolate for the top, avoid skewering a piece of chocolate otherwise you will get a false skewer result! Remove the brownie from the oven and allow to cool in the tin until ready to cut. Store in an airtight container in your pantry for up to a week. Look just like brownies with sugar.Cant wait to taste them. yumm. made these, they were delicious. used freshly ground almond butter and honey. Would peanut butter be okay for this recipe? I use Pics for other healthy recipes. Hi Michelle, yes any nut butter will work in this recipe, so that includes peanut butter. Obviously the more flavoured the nut butter, the more you will taste it in the recipe. Cashew and almond butter are quite mild, hazelnut butter will create a nutella tasting brownie and peanut butter would give this a real peanut brownie flavour. Hope that helps!